On Friday May 25, the Federal Court handed down a native title determination to the Nyangumarta and Karajarri communities across shared country near 80 Mile Beach in Western Australia. 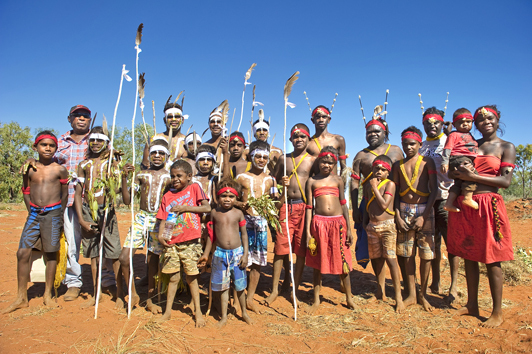 The Nyangumarta/Karajarri joint determination resolves two overlapping claims of the Nyangumarta and Karajarri peoples, two different tribal groups who share traditional laws and cultural connection to the area. Justice North handed down the Federal Court’s decision at an on-country determination at Anna Plains Station. The Kimberley Land Council and the Yamatji Marlpa Aboriginal Corporation acted on behalf of the Karajarri and Nyangumarta claimants to negotiate native title across 2,000 square kilometres of land and sea country across Anna Plains Station, a portion of Mandora Station and 80 Mile Beach, in the East Pilbara and West Kimberley regions of WA. Kimberley Land Council Executive Board Member and Karajarri Traditional Owner Anthony Watson said the Nyangumarta/Karajarri joint native title determination highlighted how two tribal groups could work together to achieve land rights. “Today’s determination is about co-operation and respect for each other. For these two groups to come together, acknowledge their shared interests in this country and achieve a successful native title consent determination is very powerful,’’ he said. Filed under: ABC, Aboriginal Heritage Act, Anthony Dann, Department of Indigenous Affairs, Traditional Owners. In an interview this morning on ABC Mid West radio, Wajarri Yamatji Traditional Owner, Anthony Dann, has responded to the State Government’s recent discussion paper on proposed changes to the Aboriginal Heritage Act 1972 (AHA). Yamaji News is looking for casual Aboriginal and Torres Strait Islander columnists and reporters to join their team. Yamaji News is Western Australia’s only Indigenous newspaper, and is dedicated to publishing local stories relevant to WA’s Aboriginal and Torres Strait Islander community. It encourages positive news, programs and events that promote the achievements of Indigenous people and their organisations. The newpaper is also seeking expressions of interest for articles and photographs, and advertisment bookings for the June 2012 NAIDOC special edition, which are due by 8 June 2012. Those interested in writing for the Yamaji News should send an example of their work and a current resume to Paul Ihanimo at paul@yamaji.com.au or call him on 0429 888 022. Screen Australia and ABC television are calling on Aboriginal and Torres Strait Islander filmmakers to submit one hour documentary proposals for ‘Black Impact’, a special initiative which aims to give voice to distinctive Indigenous Australian stories. Documentary ideas should be bold, creative and deliver fresh insights into contemporary Black Australian life. The four most most original ideas will be developed, with two chosen for possible television production. Each application must have Indigenous Australians in key creative roles. The deadline for applications is 5:00pm Friday, 25 May 2012. A new program supporting Indigenous women who have experienced domestic violence will begin next week in Geraldton. The program, run by Centacare Family Services, aims to strengthen family relationships and help create positive change in lives through services such as counselling and spiritual healing. The sessions will take place in a group therapy setting and discussions will remain strictly confidential. Participants will have the opportunity to discuss topics with professionals who specialise in areas such as domestic violence, grief or loss, general health, substance abuse and stress management. There are five sessions in all, with the first beginning Tuesday 15 May at the Spalding Family Centre on Mitchell Street, Geraldton from 9am-12pm. To register and organise an initial one-on-one chat with the facilitator, call the Geraldton Family Relationship Centre on 9921 2611. For more information please visit the Centacare Geraldton website or the Geraldton Family Relationship Centre website. Yesterday YMAC representatives attended the launch of Monty Hale’s bilingual book ‘Kurlumarniny – We come from the desert’ at the Warralong community. Monty Hale is one of the quiet achievers of Indigenous Australia , and one of its greatest intellectuals. 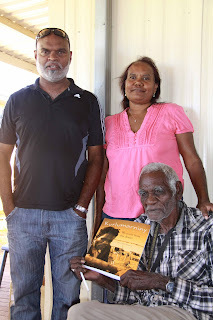 A senior Nguliparti man from the Pilbara region, his book tells of his family’s migration from the desert to the station country in the eastern Pilbara, his childhood growing up on Mt Edgar Station, witnessing Australia’s engagement in World War two and the famous Pilbara station-workers strike of 1946. The remarkable bilingual publication, written in Nyangumarta and English, tells Monty’s experiences though his vast cultural knowledge and his strong desire to leave a record of his life. The book will soon be available to purchase from Wangka Maya Language Centre and is a remarkable record of Aboriginal life in the Pilbara. Visit http://www.wangkamaya.org.au/ for more Indigenous publications from the Pilbara.